In anticipation of the release of Pope Francis’ encyclical regarding the environment, we’d like to spotlight some of the Catholic Care for Creation initiatives in Ohio. Catholic teachings have always stressed the importance of care for the environment. 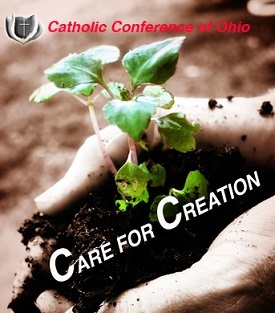 The Catholic Conference of Ohio, which represents each Catholic diocese in the state, has an environmental stewardship campaign, Environmental Justice Program, and an environmental issues awareness website, Care for Creation. The programs aim to reflect the religious, stewardship, and moral values that are central to Catholic teachings and faith. All of the programs work to encourage involvement and issue awareness. A widespread environmental interest among the Catholic community, combined with the religious values in the Catholic faith, generate support for the programs. Care for Creation provides excellent resources for anyone interested in learning more about environmental stewardship and current issues. Raising issue awareness and encouraging involvement is a key goal. Click here for the Care for Creation website. Many complex questions are raised when people become involved. What is sustainable? What is economically feasible? Care for Creation asks people to examine their consciences. Here are some of the questions the site raises: Do I live out my responsibility to care for God’s creation? Do I see my care for creation as connected to my concern for poor persons, who are most at risk from environmental problems? Do I litter? Live wastefully? Use energy too freely? The Environmental Justice Program encourages Catholics to develop a deep respect for God’s creation. The program also encourages Catholics to become involved in environmental issues, particularly issues that affect the poor, children, and other vulnerable groups. The Environmental Justice Program has strong Catholic origins based on Pope John Paul II’s 1990 World Day of Peace message. A large congregation is bound to have diverse members with different ideas of stewardship, so the focus is placed on provoking people to raise questions about environmental issues and encouraging involvement in issues that strike close to the heart. Alternative energy standards are a salient issue. The Catholic Conference of Ohio firmly believes that every effort, whether it be changing to energy friendly light bulbs or adding solar panels, is a step in the right direction. The Catholic Conference of Ohio acknowledges that success varies, but is proud of its accomplishments. The program has had success engaging in dialogue with different groups in an effort to find common ground. Dialogue will continue to lead to progress and understanding between different sides in complex issues that regard the environment and stewardship. Care for Creation has done an excellent job raising awareness and concern among Catholic communities and many have formed committees, which are directly concerned with the environment. The Catholic Conference of Ohio hopes to continue to reach the hearts and minds of people and encourage knowledge seeking and involvement. No matter what the future holds, the Catholic Conference of Ohio will stand by its core beliefs and continue to reflect their religious values in their stewardship efforts. Watch for additional stories from the Catholic faith community. Go to our Earth Stewards Directory for an entry about the ministry of The Archdiocese of Cincinnati Climate Change Task Force.